Master Sculptor Robert Olszewski's warm, whimsical and highly acclaimed self portrait is found in "Portrait of the Artist." This remarkable miniature figurine was available only to collectors attending an Olszewski seminar or one of his promotional visits during the later years while he was at Goebel. 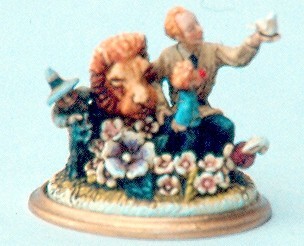 Only 300 miniature figurines were produced in 1993 and retired that following year. An additional unknown number of these pieces were produced as in response to dealers demands. Olszewski created this piece as a tribute to his collectors and give them something to cherish as he continued to build relationships. The figurine depicts Olszewski, himself, holding a white dove. Beside him is Cowardly Lion from the Wizard of Oz story. Next to the Lion you will find a Munchkin representing the collectors who loves his work. Additionally, a small boy, David, with a clowns nose stands near his Dad. The figurine carries the design mark of 658-P and issued in 1991 at the price of $195.00. Only 300 of these were made and some have sold for as high as $515.00 in 1993. The rarity of the piece justifies the selling price.